SRINAGAR: Thousands of mourners gathered on Friday for the funeral of a veteran journalist shot dead by unidentified gunmen on a motorbike outside his office in the main city of Indian-held Kashmir (IHK). Shujaat Bukhari, a leading journalist and editor of the English-language daily Rising Kashmir, was leaving his office in Srinagar on Thursday evening when three assailants roared up and fired several shots from close range. Bukhari, 50, was rushed to hospital but was later declared dead. Two of his personal security guards also died. 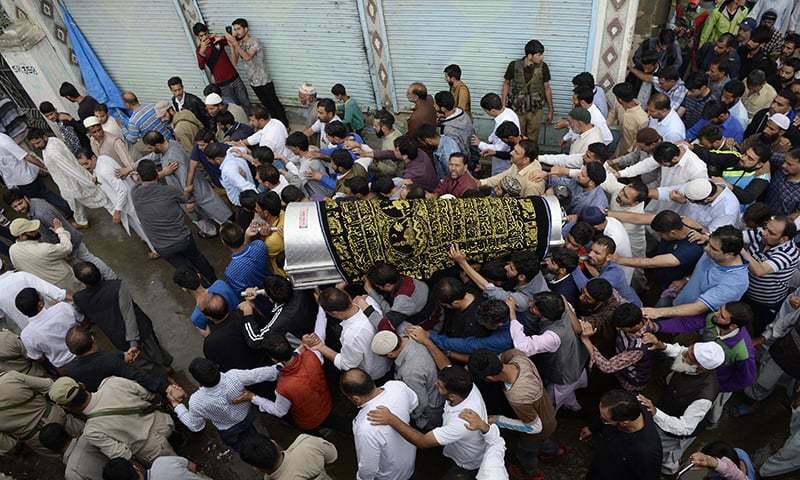 On Friday, funeral prayers were held at the Jamia Masjid grand mosque in Srinagar before the burial in his native village in northern Kashmir. Bukhari, who was given police protection following three attacks on him in the past decade, had been a strong advocate of peace in Kashmir. New Delhi has about 500,000 soldiers in India-held Kashmir, where armed groups are fighting for independence or a merger with Pakistan. Bukhari took part in informal peace talks on Kashmir with Pakistani representatives in Dubai last year. His final tweet, sent just a few hours before his murder, was a link to his website’s reporting of the UN human rights chief calling for a major investigation into abuses committed by both India and Pakistan in Kashmir. The identity of the attackers and the motive for the killing was not yet known but Srinagar police released CCTV footage of the three suspects on the motorbike. The government of Jammu and Kashmir has ordered a high-level investigation into the attack that came hours before Eidul Fitr began. Rising Kashmir on Friday carried a full-blown portrait of Bukhari on its front page against a black background. The murder has been condemned by political leaders who hailed Bukhari as a fearless and courageous journalist. “Terrorism has hit a new low with Shujaat’s killing. That too, on the eve of Eid. We must unite against forces seeking to undermine our attempts to restore peace. Justice will be done,” tweeted Jammu and Kashmir Chief Minister Mehbooba Mufti.